The Permanent Secretary for Ministry of Industry and Trade Shaheen Ali and RBF Governor Ariff Ali with awardees during the 2017 National Microfinance Awards at the RBF building on May 28,2018. Photo: Simione Haravanua. Vitilia Vuniwaqa was working as a flight attendant for the then Air Pacific when tragedy struck. She suffered from stroke and was without a job for some time. Until she found her own business inspiration. The 44-year-old from Lovu Village in Gau, Lomaiviti, manages her own cash crop beekeeping farm. Yesterday her story became known. Ms Vuniwaqa became the winner of Inspirational female Micro Business. She was among 19 who was awarded during the Reserve Bank of Fiji 2017 National Microfinance Awards at RBF in Suva yesterday. Her business has flourished as she is focusing on establishing a good customer base before she expands her business further. “In spite all odds, I managed to established and take the business to where it is today,” said Ms Vuniwaqa. “I’ve had to find a reason to get up in the morning and the farm gave me my life back,” she smiled. RBF Governor and chairperson of the National Finacial Inclusion Taskforce, Ariff Ali congratulated the finalists for their determination and perserverance to make their goals and dreams a reality in the different businesses that they have established and operated. Mr Ali said a developing country like Fiji, the potential for the micro entreprises sector to be a driver of economic growth that cannot be understimated and were appreciated on how the businesses are recognised. “The Reserve Bank of Fiji has worked closely with government, development partners and the private sector to find ways of improving the SME sectors access to finance and enhancing the sector’s contribution to the economy. “Bank’s support is to develop microfinance in Fiji and is not without challenge, as a third of our population who are mostly women and rural dwellers and styill do not have access to afford appropriate financial services,” he said. However, he said the bank is pleased to provide assurance that will continue to contribute and support intiatives for the development of the Fijian economy. Government, he said do not create jobs, the private sector does and that within the private sector, Small and medium-sized enterprises (SMEs) are central to that endeavour. “The important role of Micro, Small and Medium Enterprises (MSMEs) play in creating jobs as they provide the bulk of employment in the country and in turn support economic growth,” he said. The unprecedented economic growth that Fiji has achieved in the last eight consecutive years, he said is also attributed to the growing micro and SME sectors. “SME sector accounts for almost 90 per cent of businesses and there are some estimates that MSMEs account for around 60 per cent of employment as everyone cannot be employed in the formal sector,” he said. Allowing people to help and create employment opportunities fortrhemselves, he said are effectively contributing towards reducing poverty and increasing standards of living. “As a result there is less reliance on Government in terms of receiving social welfare,” he said. Mr Ali highlighted from his personal experience is that one of the most important attributes he admired about micro-buisness is their ability to empower people to determine their individual path. “The MSME industry is very close to my heart because i have experienced work in it first-hand whereby my father operated as a micro entreprise in the fisheries sector emplying two-three others and it was his hard work and sacrfices that paid for our school fees and education,” he said. “My family is still engaged in micro and small entreprise work today and when i hear about winners stories it reminded me of the struggles and challenges that my father and our family had to endure especially because in those days there was little to no support from the Government and other stakeholdoers specifically for MSMEs,” he said. “That is why i fully support this initiative and i am confident that it will enable us to make positive changes in our own lives,” he added. 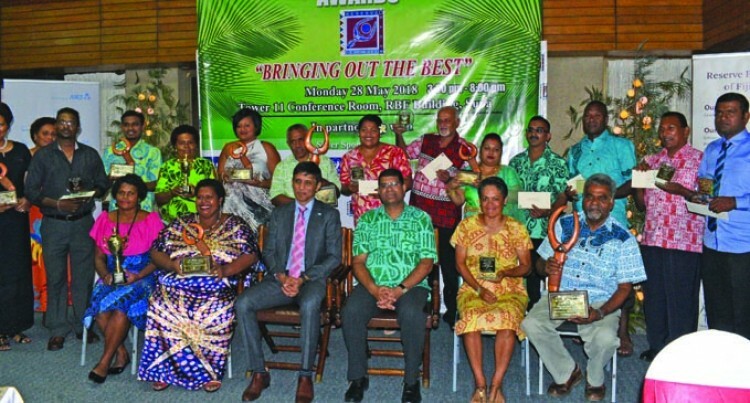 “This year, Microfinance awards received the highest number of submissions mainly from Viti Levu and a few from Vanua Levu, Taveuni, Lau and Gau. Submissions were assessed by three judges from the Ministry of Women, Children and Poverty Alleviation, The University of the South Pacific and RBF. The Individual, Partnership and Youth categories were assessed on business growth and use of local resources and creativity,adequate book-keeping, sustainability and compliance with government regulations.